We're going VEGAN here this week on Soliloquy Of Food & Such! Yay.......yay? Yes. Whoo hoo, yay, vegan! All three posts this week will be meat-free and dairy-free; Morrisey would approve. So, my gurl Shurl....um, actually, she's Shirley....and, technically, she's my brother's girl...I just like saying: my gurl Shurl...humor me, people. Anywho, Shirley had requested some vegan dishes; her and my brother have been pretty much vegetarian for the past 6 months, or so, and toying with the idea of going full-on vegan. Me? Sorry, I love cheese too much, but I can try it for a week...maybe. So, let's do this! 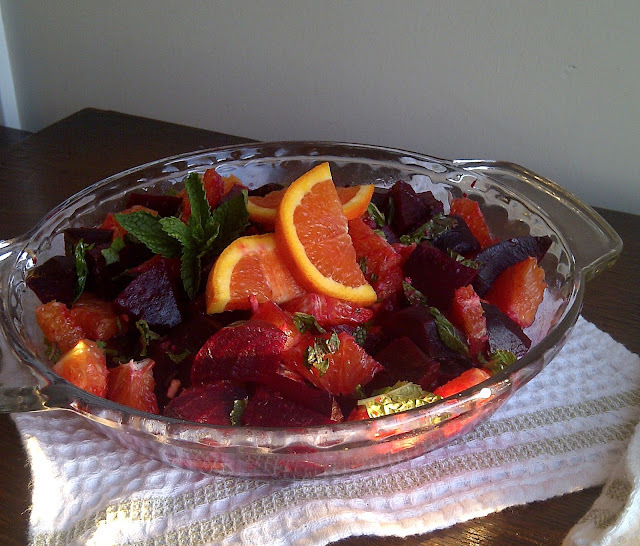 Beet & Orange Salad was created because I had beets, oranges, and mint on-hand. I made a quick vinaigrette to serve this with, but I didn't even use it. I thought the beets, oranges, and mint were enough all on their own. Red, beet-stained hands were minimal. After I ate this, I ran to the mirror to see if the beet-stained-teeth thing (The Office) held true. Red, beet-stained teeth were also minimal, but I brushed with my Colagate Total Whitening toothpaste anyway. I must sadly admit, Cara Cara oranges are reaching the end of their season. I have come to terms with this. I will be okay...let's just have a moment of silence for the 2102-2013 crop. 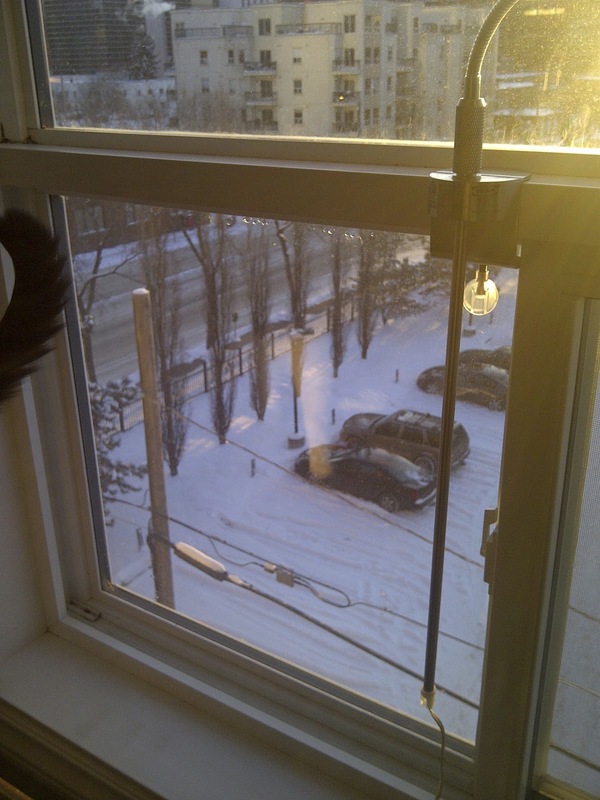 There is about 8 inches of freshly fallen snow outside; Spring is not close yet, in Edmonton. So, this is my most scatterbrained post yet! 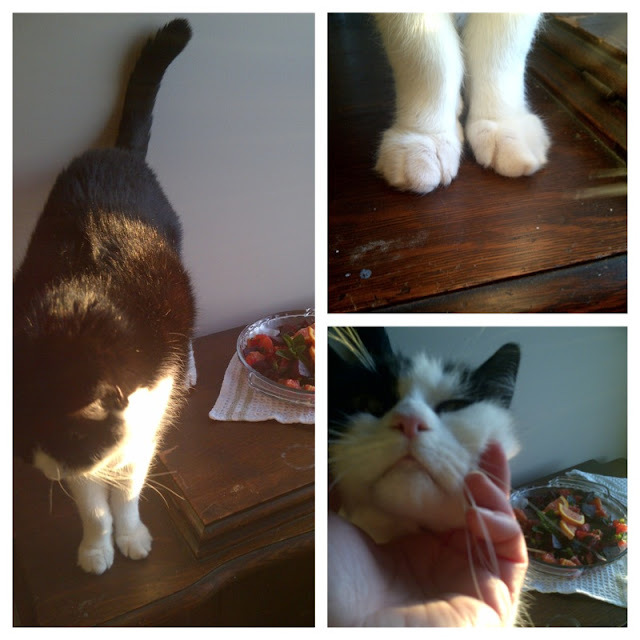 Veganism, a Morrisey reference, The Office reference, cat photo-bombing, an orange remembrance, beet stains, snow, sunlight angles....what were we suppose to be talking about? 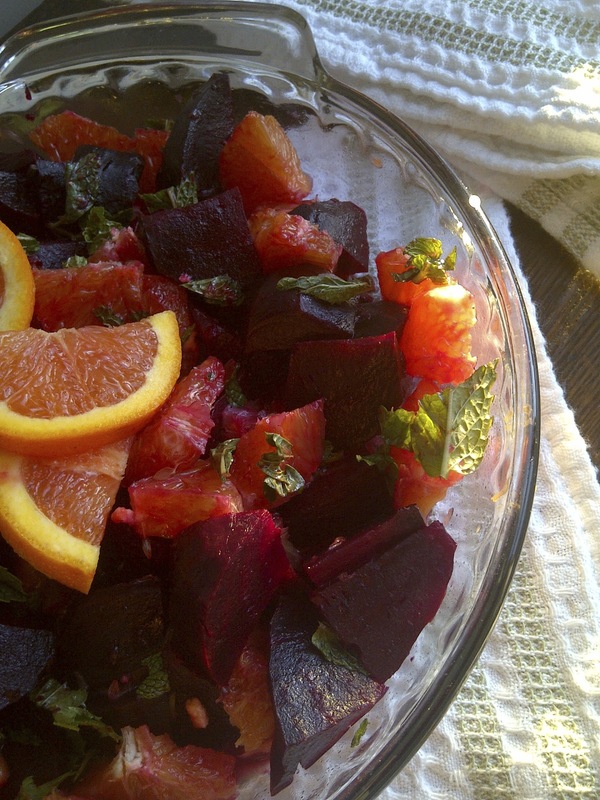 Oh yeah, Beet & Orange Salad. 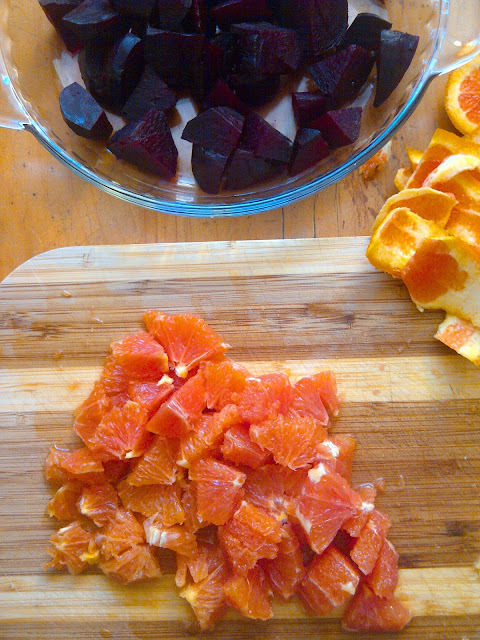 The roasted beets have that beety sweetness to them, the oranges are even sweeter. The mint, in contrast with beets and oranges, takes on a savory part; which is a little weird because we usually associate mint with being sweet. But it all somehow works, I think anyway. As I mentioned, I didn't dress this, I ate it as is...but if you wanted to get jiggy wit' it, you could toss it in a tangy vinaigrette and play with sweet and sour contrasting flavors. Preheat oven to 400 degrees. Wash and trim beets, drizzle with 2 tsp of olive oil. 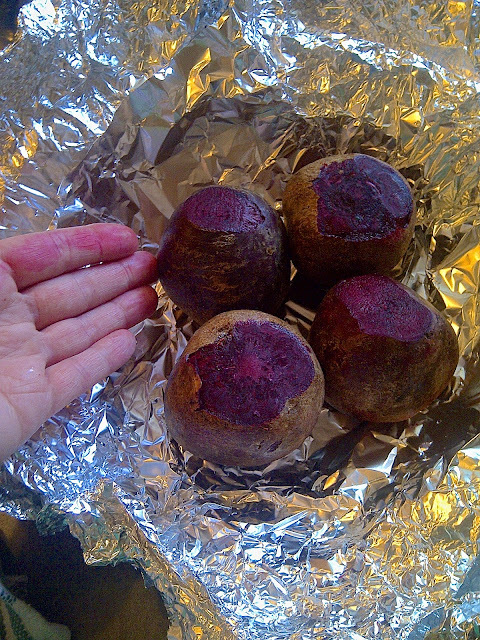 Wrap beets in a double layer of tin foil, seal tightly. Place foil packet on a small pan, roast 45 minutes until beets are fork tender. Cool completely. Peel cooled beets using a sharp knife, try to take just the skin off and not too much of the flesh. Cut each beet in half, and then each half into 8 pieces. For the oranges, slice off the tops and bottoms, then slice down the sides - taking off just the skin and the pith. 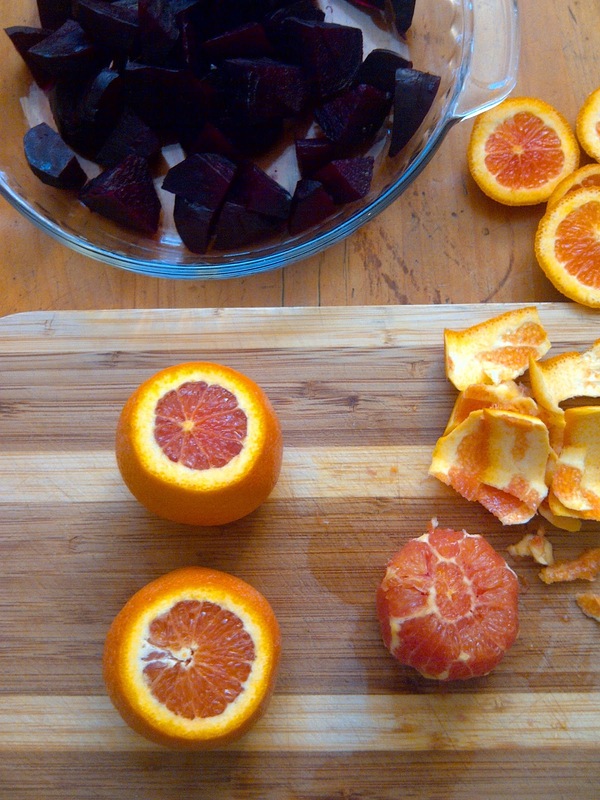 Chop the peeled oranges in the same fashion as the beets. 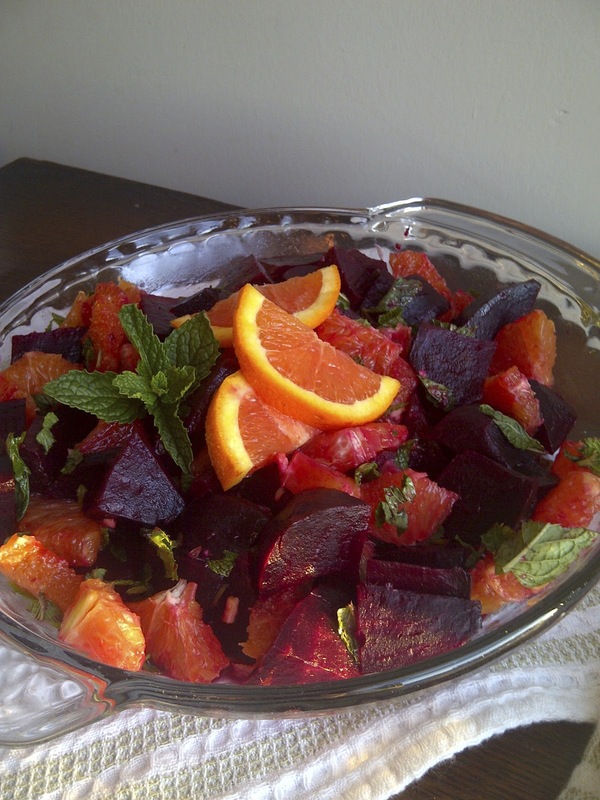 Combine the chopped beets and oranges in a bowl, add the chopped mint, toss to combine. In a small jar, add the remaining 1TBS of olive oil, vinegar, honey, and orange juice. Cover and shake to combine. Add salt & pepper to taste if needed. Serve either at room temperature, or cover and chill to serve cold. Pass the dressing around when serving, or toss with the salad and serve immediately.